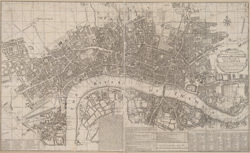 Map scale description: 10'' : 1 m.
The title of this map of London appears in cartouche at middle right, with compass rose at top right, and a key to buildings at bottom right. A historical note appears at bottom centre along with a scale bar, the fares of hackney coaches and water ferries, and illustrations of oars and sculls. This map is divided into squares with numbers along borders for reference.